, “Pietro Lorenzetti/Saint Catherine of Alexandria, with an Angel [right panel]/probably 1340,” Italian Paintings of the Thirteenth and Fourteenth Centuries, NGA Online Editions, https://purl.org/nga/collection/artobject/893 (accessed April 18, 2019). 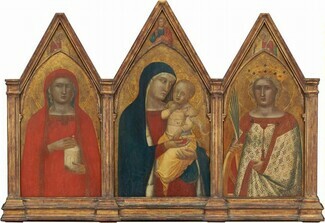 This painting belongs to a triptych, which also includes Madonna and Child, with the Blessing Christ [middle panel] and Saint Mary Magdalene, with an Angel [left panel]. The image represents Saint Catherine of Alexandria, who is identified by her crown and by the wheel of martyrdom she supports with her right hand. According to the Golden Legend, Saint Catherine had contested Emperor Maxentius's persecution of Christians and successfully rebutted the arguments of 50 philosophers and orators who had sought to ruin her faith in Christ. Having been thwarted, the emperor ordered that Catherine be executed with spiked wheels. The wheels, however, were shattered through divine intervention. 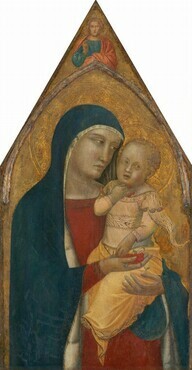 An inscription, which survives on a fragment of the original frame (now incorporated in a modern support and located beneath the triptych's central panel of Madonna and Child, with the Blessing Christ [middle panel], records the artist's signature: Pietro Lorenzetti of Siena painted me in 1340. Pietro and his brother Ambrogio are often noted for the inventive ways in which they defined three-dimensional space and incorporated details from everyday life to expand the realism of their figures and settings. However, they also painted icon-like devotional pictures, such as this one. During this period, Pietro seems to have been especially influenced by Giotto (Florentine, c. 1265 - 1337), as seen in the quiet solemnity of the composition, in which a massive figure fills nearly the entire panel. The figure’s clothing also typifies Giotto's style: heavy fabrics fall perpendicularly in a few simplified or pointed folds to emphasize the figure's solidity. Apart from the scene of the Annunciation of the Death of Mary, in which Gabriel generally hands a palm branch to her, this attribute is alien to the iconography of the angels; cf. “Engel,” in Lexikon der christlichen Ikonographie, eds. Engelbert Kirschbaum and Günter Bandmann, 8 vols. (Rome, Basel, and Vienna, 1968), 1:626–642. In the present context, the motif probably is meant as a symbol of triumph, as in various biblical narratives—for example, in that relating to the celebration of the feast of Tabernacles (Lev 23:34, 40), or an important military victory of Simon Maccabeus (1 Mac 13:51), or the entry of Christ into Jerusalem (Mt 21:8; Jn 12:12). Ernest De Wald to Charles Parkhurst, August 25, 1942, letter in NGA curatorial files. National Gallery of Art, European Paintings: An Illustrated Catalogue (Washington, DC, 1985), 232; Carlo Volpe, Pietro Lorenzetti, ed. Mauro Lucco (Milan, 1989), 195–196; Erling S. Skaug, Punch Marks from Giotto to Fra Angelico: Attribution, Chronology, and Workshop Relationships in Tuscan Panel Painting with Particular Consideration to Florence, c. 1330–1430, 2 vols. (Oslo, 1994), 1:226, 228; Cristina De Benedictis, “Lorenzetti, Pietro,” in Enciclopedia dell’arte medievale, 12 vols. (Rome, 1996), 7:884, 892; Alessio Monciatti, “Pietro Lorenzetti,” in Pietro and Ambrogio Lorenzetti, ed. Chiara Frugoni (Florence, 2002), 80, 82; Keith Christiansen, “Paul Delaroche’s Crucifixion by Pietro Lorenzetti,” Apollo 157 (2003): 14 nn. 17, 19; Rudolf Hiller von Gaertringen, Ita­lienische Gemälde im Städel 1300–1550: Toskana und Umbrien, Kataloge der Gemälde im Städelschen Kunstinstitut Frankfurt am Main (Mainz, 2004), 152 n. 44; Michela Becchis, “Lorenzetti, Pietro,” in Dizionario biografico degli italiani, 82 vols. (Rome, 2005), 65:809; Ada Labriola, in Maestri senesi e toscani nel Lindenau-Museum di Altenburg, ed. Miklós Boskovits and Johannes Tripps (Siena, 2008), 42; Laurence B. Kanter and John Marciari, Italian Paintings from the Richard L. Feigen Collection (New Haven, 2010), 20. Often ascribed to the bottega or school of Pietro Lorenzetti, the work was claimed as an autograph of Pietro himself by Carlo Volpe (1951). In his monograph (1989), Volpe dated the painting to the years 1340–1345, but the close kinship in style with Ambrogio would, in my view, make a dating in the late 1330s more plausible. See Carlo Volpe, “Proposte per il problema di Pietro Lorenzetti,” Paragone 2, no. 23 (1951): 13; Carlo Volpe, Pietro Lorenzetti, ed. Mauro Lucco (Milan, 1989), 197–198. Unfortunately, perhaps also because of the Washington triptych’s compromised state, the analysis of the punched ornament provides no useful indications to confirm or deny the conclusions reached by an interpretation of the stylistic data, but it should be observed that the decorative motifs of the dress of Saint Catherine are very similar to those of the cloth of honor of the Madonna in the Uffizi and seem to confirm that the two works belong to the same period. Cf. Giorgio Vasari, Le vite dei più eccellenti pittori, scultori ed architettori, ed. Gaetano Milanesi, 9 vols. (Florence, 1878–1885), 1:473. On the otherwise rare motif of the cherries in Trecento painting, cf. note 1 above. Recently, Laurence Kanter noted that five of the six punches used in the Washington painting “do not recur in any other painting by Lorenzetti, nor in any other Sienese painting,” and he wondered if it could have been painted in Florence, based on the fact that at least one of the punches is found there as early as 1337 and that the shape of the panels in the Washington altarpiece is more commonly encountered in Florentine than in Sienese carpentry. Laurence B. Kanter and John Marciari, Italian Paintings from the Richard L. Feigen Collection (New Haven, 2010), 20. In any case, the stylistic character seems to coincide with the evidence of the signature and the date preserved on the fragment of the original frame that has come down to us. As for the possible intervention of studio assistants, the state of preservation of the painting today prevents, in my view, speculations of this kind. Doubts perhaps can be raised about the inscription itself, because we do not know how it was recovered and inserted into the existing frame. But it is hardly probable that the signature of the artist and the date 1340 (or 1341 or 1342) would have been added to the painting by another hand, concordant with the features of this particular phase in Pietro’s career. Probably the art market, Florence, by 1924; (Alessandro Contini, Rome), by 1926; sold 1927 to Felix M. Warburg [1871-1937], New York; by inheritance to his wife, Frieda Schiff Warburg [1876-1958], New York; gift 1941 to NGA. Raimond van Marle (The Development of the Italian Schools of Painting, The Hague, 1924: 2:363) reports, rather imprecisely, “A short time ago . . . half-length figures [similar, according to NGA systematic catalogue Miklós Boskovits, to Pietro’s panels nos. 79, 81 and 82 in the Pinacoteca Nazionale in Siena] were offered for sale in Florence.” Nonetheless, adds the author, “these may have been products of Pietro’s bottega only.” Miklós Boskovits did not know of other panels of half-length saints attributable to the elder Lorenzetti on the art market at that time and thought it very likely that van Marle was referring to the NGA paintings. Contini (later Contini-Bonacossi) gathered expertises (in NGA curatorial files) on the triptych in 1926, so it must have been in his possession by then. Correspondence about the panels among Warburg, Contini, Paul Sachs (Warburg’s advisor), and the restorers Hammond Smith and Stephen Pichetto began in 1926, but stops in 1927, the year Warburg probably bought the three panels (correspondence in NGA curatorial files). When Ernest Theodore De Wald published the triptych in 1929 (Art Studies: Medieval Renaissance and Modern : 34 n. 1, and figs. 99-101), it already belonged to the Warburg collection. Masterpieces of Art. European Paintings and Sculpture from 1300-1800, New York World's Fair, 1939, no. 221, pl. 5. The examination report of the NGA painting conservation department states, “There are at least two or three generations of retouching hidden below the discolored varnish layer” (see report dated September 9, 1988, in NGA conservation files). Unfortunately, no documentation exists of the various restorations of the triptych that took place prior to the 1941–1942 treatment, one of which may have occurred after its acquisition by Alessandro Contini-Bonacossi in 1926. Correspondence between Contini-­Bonacossi and Stephen Pichetto discussed the possible treatment of the paintings at this time, but it is unclear if they were actually treated. See Ann Hoenigs­wald, “Stephen Pichetto, Conservator of the Kress Collection, 1927–1949,” in Studying and Conserving Paintings: Occasional Papers on the Samuel H. Kress Collection (London, 2006), 30, 37. At some point, the paintings apparently were energetically cleaned and generously retouched, in order to render the much-abraded forms more easily readable. Emilio Cecchi’s monograph (1930) reproduced the triptych probably before this treatment (figs. 2, 3, and 4). The inpainting in this reproduction appeared to be more discreet than in the illustration published in the monograph by Ernest De Wald (1929); he apparently used a more recent set of photographs. In De Wald’s publication, the three panels still were separated, and the modeling appeared reinforced by further retouching. Cf. Emilio Cecchi, Pietro Lorenzetti (Milan, 1930), pls. 104–106; Ernest T. De Wald, “Pietro Lorenzetti,” Art Studies 7 (1929): pls. 99–101. The inpainting is particularly extensive in the Madonna’s robes, but the shadows in the saints’ faces are also heavily reinforced and remodeled, making the painting difficult to assess. In addition, the gold-leafed details in all of the paintings have been strengthened. DeWald, Ernest T. "Pietro Lorenzetti." Art Studies 7 (1929): 162 n. 1, pl. 101. Cecchi, Emilio. Pietro Lorenzetti. Milan, 1930: 37, pl. 106. Berenson, Bernard. Italian Pictures of the Renaissance: A List of the Principal Artists and Their Works with an Index of Places. Oxford, 1932: 293. Marle, Raimond van. Le scuole della pittura italiana. 2 vols. The Hague and Florence, 1932-1934: 2(1934):361. Sinibaldi, Giulia. I Lorenzetti. Siena, 1933: 175. Berenson, Bernard. Pitture italiane del rinascimento: catalogo dei principali artisti e delle loro opere con un indice dei luoghi. Translated by Emilio Cecchi. Milan, 1936: 252. Book of Illustrations. National Gallery of Art, Washington, 1942: 251, repro. 135. Einstein, Lewis. Looking at Italian Pictures in the National Gallery of Art. Washington, 1951: 25 n. 1. Becchis, Michela. "Lorenzetti, Pietro." In Dizionario biografico degli italiani. Edited by Alberto Maria Ghisalberti. 82+ vols. Rome, 1960+: 65(2005):809. Summary Catalogue of European Paintings and Sculpture. National Gallery of Art, Washington, 1965: 77. Berenson, Bernard. Italian Pictures of the Renaissance. Central Italian and North Italian Schools. 3 vols. London, 1968: 2:221. Fredericksen, Burton B., and Federico Zeri. Census of Pre-Nineteenth Century Italian Paintings in North American Public Collections. Cambridge, Mass., 1972: 109, 312, 429, 646. European Paintings: An Illustrated Summary Catalogue. National Gallery of Art, Washington, 1975: 198, repro. Frinta, Mojmir Svatopluk. "Deletions from the Oeuvre of Pietro Lorenzetti and Related Works by the Master of the Beata Umilità, Mino Parcis da Siena and Iacopo di Mino del Pellicciaio." Mitteilungen des Kunsthistorischen Institutes in Florenz 20 (1976): 290. Laclotte, Michel. "Un ‘Saint Evêque’ de Pietro Lorenzetti." Paragone 27 (1976): 18 n. 7. Shapley, Fern Rusk. Catalogue of the Italian Paintings. National Gallery of Art. 2 vols. Washington, 1979: 1:269-270; 2:pl. 185. European Paintings: An Illustrated Catalogue. National Gallery of Art, Washington, 1985: 232, repro. Volpe, Carlo. Pietro Lorenzetti. Edited by Mauro Lucco. Milan, 1989: 195-196, fig. 175. De Benedictis, Cristina. "Lorenzetti, Pietro." In Enciclopedia dell’arte medievale. Edited by Istituto della Enciclopedia italiana. 12 vols. Rome, 1991-2002: 7(1996):884, 892. Skaug, Erling S. Punch Marks from Giotto to Fra Angelico: Attribution, Chronology, and Workshop Relationships in Tuscan Panel Painting with Particular Consideration to Florence, c. 1330-1430. 2 vols. Oslo, 1994: 1:226, 228; 2:punch chart 7.5. Frinta, Mojmír S. Punched Decoration on Late Medieval Panel and Miniature Painting. Prague, 1998: 61, 97, 336, 483. Monciatti, Alessio. "Pietro Lorenzetti." In Pietro and Ambrogio Lorenzetti. Edited by Chiara Frugoni. Florence, 2002: 80, repro. 82. Christiansen, Keith. "Paul Delaroche’s Crucifixion by Pietro Lorenzetti." Apollo 157 (2003): 14 nn. 17, 19. Hiller von Gaertringen, Rudolf. Italienische Gemälde im Städel 1300-1550: Toskana und Umbrien. Kataloge der Gemälde im Städelschen Kunstinstitut Frankfurt am Main. Mainz, 2004: 152 n. 44. Hoenigswald, Ann. "Stephen Pichetto, Conservator of the Kress Collection, 1927-1949." in Studying and Conserving Paintings: Occasional Papers on the Samuel H. Kress Collection. London, 2006: 30 (repro. ), 37. Boskovits, Miklós, and Johannes Tripps, eds. Maestri senesi e toscani nel Lindenau-Museum di Altenburg. Exh. cat. Santa Maria della Scala, Siena, 2008: 42. Kanter, Laurence B., and John Marciari, eds. Italian Paintings from the Richard L. Feigen Collection. Exh. cat. Yale University Art Gallery, New Haven, 2010: 20. On the iconography of the Virgin of Hodegetria type, see note 1 in the entry on Enthroned Madonna and Child. Cherries, symbols of the Annunciation and the Incarnation of Christ but also of the blood of the Redeemer, frequently accompany representations of the Madonna and Child in fifteenth-century paintings; far less frequently do they appear in paintings of the previous century. Cf. Mirella Levi D’Ancona, The Garden of the Renaissance: Botanical Symbolism in Italian Painting (Florence, 1977), 89–93. Nevertheless, cf. some versions of the Madonna and Child painted by painters active in Pisa, such as Francesco Neri da Volterra in his panel at San Benedetto a Settimo, Spinello Aretino in a painting commissioned from him in Pisa (no. 3130, Staatsgalerie, Stuttgart), and Cecco di Pietro in a panel in the Musée in Tours and in another similar panel in the church of San Torpè at Pisa: cf. Mariagiulia Burresi, ed., Pisa e l’area pisana, I luoghi della fede (Milan, 2000), 137–138; and Andrea De Marchi, in Italies: Peintures des musées de la région Centre, ed. Annie Gilet and Éric Moinet (Paris, 1996), 75–76. For a Sienese example of the child carrying cherries in his hand, cf. the panel by Ambrogio Lorenzetti in the parish church of Roccalbenga, Siena; see Enzo Carli, La pittura senese del Trecento (Milan, 1981), 212–214. Dorothy C. Shorr (1954) interpreted the motif as “fruit of Heaven”; Dorothy C. Shorr, The Christ Child in Devotional Images in Italy during the XIV Century (New York, 1954), 112. In Tuscan panels of the early fourteenth century, the child at times appears naked, at times dressed in a tunic and mantle all’antica, or a garment that recalls the shirt or dalmatic used by celebrants on certain liturgical occasions. Sometimes, however, as in the Maestà by Simone Martini (Sienese, active from 1315; died 1344) in the Palazzo Pubblico in Siena, or in the Madonna and Child by Pietro Lorenzetti himself in the pieve of Castiglione d’Orcia, the child wears a dress that bears no relation to the liturgical conventions of the day, such as a smock furnished with prominent buttons or laces, which probably reflects children’s garments of the time. See Carlo Volpe, Pietro Lorenzetti, ed. Mauro Lucco (Milan, 1989), 113–115. 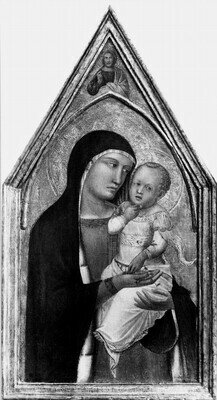 To this group belong, from the fourth and fifth decades of the fourteenth century onwards, images representing the child dressed in smocks with short but very wide sleeves, such as that illustrated in our painting or in some panels by Bernardo Daddi (active by 1320, died probably 1348) (Madonna no. 553 in the Walters Art Gallery in Baltimore, or Madonna no. 1923.35 in the Fogg Art Museum in Cambridge, Massachusetts). On the development of the fashion of the manicottolo and its reflections in painting of the early fourteenth century, see Luciano Bellosi, Buffalmacco e il Trionfo della morte (Turin, 1974), 41–54. Cf. George Kaftal, Saints in Italian Art, vol. 1, Iconography of the Saints in Tuscan Painting (Florence, 1952), 717–720. Cf. George Kaftal, Saints in Italian Art, vol. 2, Iconography of the Saints in Central and South Italian Schools of Painting (Florence, 1965), 255–266. It is not clear when or how the fragment containing the inscription of the lost original frame was removed. It already had been removed from the original frame, and was incorporated into the frame that was on the painting when the current frame was commissioned in 1941–1942. The literature long ignored the inscription, probably due to difficulties in reading it. Its transcription was published for the first time in the NGA catalog of 1965, with the date interpreted as MCCCXXI. This was repeated in NGA 1985, although Charles Parkhurst had already sent the transcription to the Frick Art Reference Library and Robert Langton Douglas in 1946 (letters of August 1 and 2, 1946, copies in NGA curatorial files). Parkhurst’s reading was published by Fern Rusk Shapley (1979). See National Gallery of Art, Summary Catalogue of European Paintings and Sculpture (Washington, DC, 1965), 77; National Gallery of Art, European Paintings: An Illustrated Catalogue (Washington, DC, 1985), 232; Fern Rusk Shapley,Catalogue of the Italian Paintings, 2 vols. (Washington, DC, 1979), 1:269–270. The expertises in question were furnished by such leading art historians of the time as Wilhelm von Bode (“Pietro Lorenzetti​ . . . ​ein Hauptwerk”), Georg Gronau (“ein Hauptwerk nicht nur des Pietro Lorenzetti sondern der Sienesischen Malerei”), Detlev von Hadeln (“Pietro Lorenzetti. Since years I have not seen in the market a work of such a high rank by an earlier Italian master”), Roberto Longhi (“una delle creazioni più solenni della maturità di Pietro Lorenzetti”), August L. Mayer (“Pietro Lorenzetti​ . . . ​one of the most important works of the Italian School of the Trecento”), and Wilhelm Suida (“eine charakteristische Arbeit des Pietro Lorenzetti​ . . . ​Die Erhaltung aller Teile ist eine vorzuegliche”). Restorers Stephen Pichetto (“Pietro Lorenzetti​ . . . ​the general state of the painting is almost perfect”) and Hammond Smith (oral opinion, cited by Contini in a letter to Felix Warburg of January 3, 1927: “he [Smith] considered it as one of the most important works of the 1300 Italian period in the finest possible state of preservation”) were no less fulsome in their praise. Documents in NGA curatorial files. Ernest T. DeWald, “Pietro Lorenzetti,” Art Studies 7 (1929): 162 n. 1. Emilio Cecchi, Pietro Lorenzetti (Milan, 1930), 37. Bernard Berenson, Italian Pictures of the Renaissance: A List of the Principal Artists and their Works with an Index of Places (Oxford, 1932), 293; Bernard Berenson, Pitture italiane del rinascimento: Catalogo dei principali artisti e delle loro opere con un indice dei luoghi, trans. Emilio Cecchi (Milan, 1936), 252; Bernard Berenson, Italian Pictures of the Renaissance: Central Italian and North Italian Schools, 3 vols. (London, 1968), 2:221. Raimond van Marle, Le scuole della pittura italiana, vol. 2, La scuola senese del XIV secolo (The Hague, 1934), 361. Giulia Sinibaldi, I Lorenzetti (Siena, 1933), 175. National Gallery of Art, Book of Illustrations (Washington, DC, 1942), 135, 251; National Gallery of Art, Summary Catalogue of European Paintings and Sculpture (Washington, DC, 1965), 77; National Gallery of Art, European Paintings and Sculpture: Illustrations (Washington, DC, 1968), 68. “Reading of the date uncertain,” adds the catalog entry, evidently drawing on information made available by Berenson’s Indices. National Gallery of Art, Summary Catalogue of European Paintings and Sculpture (Washington, DC, 1965), 77. Burton B. Fredericksen and Federico Zeri, Census of Pre-­Nineteenth-­Century Italian Paintings in North American Public Collections (Cambridge, MA, 1972), 109, 312, 429, 646; Michel Laclotte, “Un ‘Saint Evêque’ de Pietro Lorenzetti,” Paragone 27 (1976): 18 n. 7; Mojmir Svatopluk Frinta, “Deletions from the Oeuvre of Pietro Lorenzetti and Related Works by the Master of the Beata Umilità, Mino Parcis da Siena and Iacopo di Mino del Pellicciaio,” Mitteilungen des Kunsthistorischen Institutes in Florenz 20 (1976): 290. There is no historical evidence of this painter other than the fact that he is mentioned in a document drawn up at Arezzo on September 21, 1321, in the role of witness, together with Pietro Lorenzetti. Cf. Andrea Mariotti, “Modulo di progettazione del Polittico di Arezzo di Pietro Lorenzetti,” Critica d’arte 15 (1968): 36, no. 100. But, as far as one is able to judge from the partial publication of the document, this citation implies neither that Mino was Pietro’s assistant nor that he was the father of Jacopo di Mino. Fern Rusk Shapley, Catalogue of the Italian Paintings, 2 vols. (Washington, DC, 1979), 1:269–270. Cf. Mojmir Svatopluk Frinta, Punched Decoration on Late Medieval Panel and Miniature Painting (Prague, 1998), 61, 97, 336, 483. For the document of the commission, see Gaetano Milanesi, Documenti per la storia dell’arte senese, 3 vols. (Siena, 1854–1856), 1:194. The date can now be read as M.CCC.X, but the nineteenth-century restoration integrated the inscription, with the result that various readings of it have been proposed (1315, 1316, 1340, 1341). In 1799, however, when the painting entered the Uffizi, Florence, the date 1343 reportedly was visible in the inscription. Cf. Carlo Volpe, Pietro Lorenzetti, ed. Mauro Lucco (Milan, 1989), 166. The stylistic data confirm that the work must have been painted around 1340 or shortly after. Often ascribed to the bottega or school of Pietro Lorenzetti, the work was claimed as an autograph of Pietro himself by Carlo Volpe (1951). In his monograph (1989), Volpe dated the painting to the years 1340–1345, but the close kinship in style with Ambrogio would, in my view, make a dating in the late 1330s more plausible. See Carlo Volpe, “Proposte per il problema di Pietro Lorenzetti,” Paragone 2, no. 23 (1951): 13; Carlo Volpe, Pietro Lorenzetti, ed. Mauro Lucco (Milan, 1989), 197–198. Cf. Giorgio Vasari, Le vite dei più eccellenti pittori, scultori ed architettori, ed. Gaetano Milanesi, 9 vols. (Florence, 1878–1885), 1:473. On the otherwise rare motif of the cherries in Trecento painting, cf. note 1 above. Recently, Laurence Kanter noted that five of the six punches used in the Washington painting “do not recur in any other painting by Lorenzetti, nor in any other Sienese painting,” and he wondered if it could have been painted in Florence, based on the fact that at least one of the punches is found there as early as 1337 and that the shape of the panels in the Washington altarpiece is more commonly encountered in Florentine than in Sienese carpentry. Laurence B. Kanter and John Marciari, Italian Paintings from the Richard L. Feigen Collection (New Haven, 2010), 20. Photographs in NGA curatorial files show the paintings during the transfer performed by Stephen Pichetto. The photographs show four layers of fabric between the gesso and the panel. A single layer of fabric typically would have been used to prepare panels in Trecento Italy. The examination report of the NGA painting conservation department states, “There are at least two or three generations of retouching hidden below the discolored varnish layer” (see report dated September 9, 1988, in NGA conservation files). Unfortunately, no documentation exists of the various restorations of the triptych that took place prior to the 1941–1942 treatment, one of which may have occurred after its acquisition by Alessandro Contini-Bonacossi in 1926. Correspondence between Contini-­Bonacossi and Stephen Pichetto discussed the possible treatment of the paintings at this time, but it is unclear if they were actually treated. See Ann Hoenigs­wald, “Stephen Pichetto, Conservator of the Kress Collection, 1927–1949,” in Studying and Conserving Paintings: Occasional Papers on the Samuel H. Kress Collection (London, 2006), 30, 37. At some point, the paintings apparently were energetically cleaned and generously retouched, in order to render the much-abraded forms more easily readable. Emilio Cecchi’s monograph (1930) reproduced the triptych probably before this treatment (figs. 2, 3, and 4). The inpainting in this reproduction appeared to be more discreet than in the illustration published in the monograph by Ernest De Wald (1929); he apparently used a more recent set of photographs. In De Wald’s publication, the three panels still were separated, and the modeling appeared reinforced by further retouching. Cf. Emilio Cecchi, Pietro Lorenzetti (Milan, 1930), pls. 104–106; Ernest T. De Wald, “Pietro Lorenzetti,” Art Studies 7 (1929): pls. 99–101.